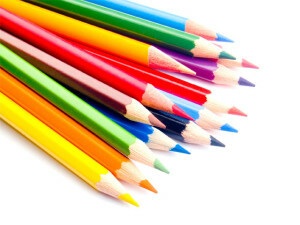 Color has certain meanings that you need to be aware of when you’re planning your marketing materials. There are also cultural meanings to color that depending upon your target market, you need to keep in mind. Green is the color of nature, growth, health, and is peaceful. It represents harmony. Lighter shades are more cheery. Darker greens represent safety and affluence (think money.) Green is often used in organic or natural brands. If you’re using a green that has too much yellow in it, be aware as it often associated with sickness or discord. Purple mixes warm and cool colors. It is passionate (red) and tranquil (blue). It represents royalty, wealth and also creativity. Lighter shades envoke romance. Red is bold. It is the color of passion and power. It is exciting. When mixed with pink, it can be sweet and innocent. If you add black, it can be dark or angry. It can also represent leadership or courage. Orange is cheerful, confident and energetic. It is very popular right now but be aware how you use it. Too much orange can be garish or can overpower your design. Yellow is the color of warmth and optimism (think the sun). It is stimulating and makes everything feel happy. It can also be used as caution (think yellow stop light or yellow road sign) It is a great highlight or accent color.